Heavy duty post hole diggers come with either a 50 hp gearbox and a 12” single cut auger MO91050 (PHD 50HP) , or a 75 hp gearbox and 15” double cut auger MO91075 (PHD 75HP) as standard. 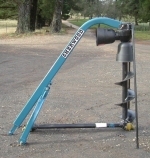 (A range of augers to suit the above are available from 6” up to 24”). Also available is a Mini Post Hole Digger with a 35 hp gearbox and 9” auger MO91035 (Mini PHD) to suit small tractors.